I'm a bit late with a "woo, 2012" post and I already feel like it should be July, but I thought I'd update you with our home cooking adventures recently, as well as some heavenly ways to treat and indulge yourself without resorting to the fridge/pantry. I've been wanting to eat healthier for a while but I wasn't particularly good at sticking to it. While we rate ourselves highly in terms of percentage of home-cooked meals to takeaway (somewhere around 95%/5% I'm guessing), the things we cooked at home would be laden with butter, cream and cheese. Now I love all these foods but they weren't doing us any good. And our portion sizes were way too big. We're now eating along the style of October Unprocessed (which I failed because I was unorganised and lured in by McDonalds) - eating foods that are as close to their natural state as possible, and minimal processed foods. This means a lot of vegetables - and I mean a lot - we literally cannot fit a weeks' worth of vegetables in our crisper. We also have a freezer full of meats, and those are the building blocks for planning out our week of meals. My sources of inspiration ranges from Whole Foods recipes - particularly their Heath Starts Here recipes, Waitrose Love Life recipes, Ottolenghi (as always! ), Amanda from Mevsthebulge and Natalie Carter from Natalie Carter Talks Fitness, as well as various other blogs. 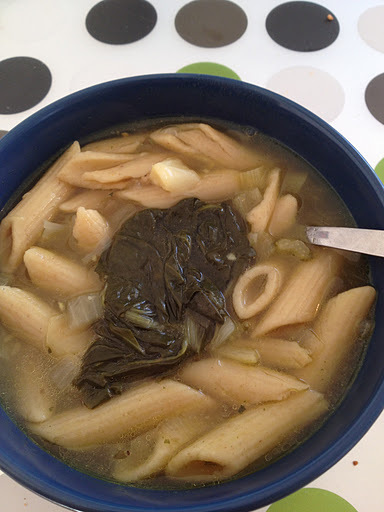 A very light, refreshing soup that fills you up thanks to the pasta (we used whole grain). Even the husband ate it, and he isn't a soup fan at all. A nice way of feeding 4 with a whole chicken in an unusual way rather than just a normal roast. We had this with a marinated pepper salad. This looks like a very bare meal - it was meant to be, I was fuelling up before exercising for 3 hours on Tuesday so like to have something that will keep me going. I really love plain grilled chicken cooked on the George Foreman as it always seems to come out really succulent and juicy. 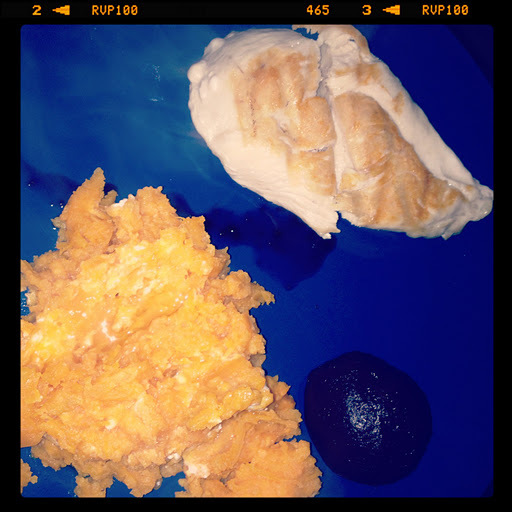 I am also lamenting the lost years of thinking I hated sweet potato... what a waste. A great Friday night dish that you can make with all your leftover vegetables in the fridge in about 20 minutes - I grilled the steak separately on the GF rather than wok cooking it and stirred it all together in the wok for about a minute (with the noodles). I made a simple Japanese dressing and poured over. I've also learnt that sesame oil is wasted as a cooking oil and now just use a dash of it as a sauce once it's all cooked - healthier, and you get more of the flavour. So I bet you're wondering about all this "treat" business. Well, I think that healthy eating gets a whole lot easier once you stop treating yourself with food. Keep your food for fuel, and use a whole range of other things for treats - whether it's a hot bath, a good book, new workout gear - just start replacing these with food for when you need a pick me up and you won't have to deal with the emotional let-down of eating a tub of icecream or bag of chips/crisps. One thing that I was treated to recently was this amazing hamper from Whole Foods. Now I've talked about Whole Foods enough that if you don't know they have opened in Giffnock recently, I'm going to assume you must be a new reader. In the hamper was a great arrange of vitamins and supplements (which I have been taking religiously) as well as some beautiful face/body products. Some of the beauty products are exclusive to Whole Foods and are all natural. I am saving these to "treat" myself when I need a boost, but I am currently using the Neal's Yard Frankincense Hydrating Cream and I love it to bits. If you're looking for a pick-me-up, or need some TLC after the New Year, why don't you pop into Whole Body (the beauty section) the next time you're in Whole Foods? I'd love to hear some of your healthy recipe ideas - please share them with me!